After at least six visits over a 3 year span, we finally have a review of Bradley's Corner Cafe in the NOTO arts area of Topeka, Kansas. The restaurant was 13 years old on our first visit. There was a heavy lunch traffic on that Saturday and we had to wait a few minutes for a table. My bacon cheeseburger and fresh cut fries were OK, and Linda's chicken fried steak with mashed potatoes was better, but the highlight was the pies. There were 27 pies, all made in-house and the sour cream raisin meringue pie was one of the best pies I have ever had! The pie filling was good, the meringue was OK and the crust was very good, but a bite of all three together was heaven. Linda's chocolate peanut butter pie was also very good. On subsequent visits I've found most items to be good, with the best being the hash brown potatoes with breakfast steak and the cheese and potato soup. 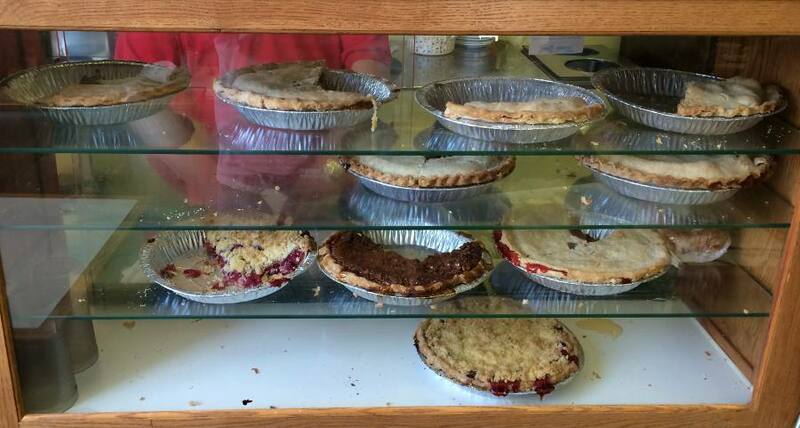 Every visit has included pie and one time we just bought a bunch of slices of pie to go and split them with family who live in Topeka. This pie case does not include the refrigerated pies. The pie menu changes regularly.